In a 40-minute defensive slugfest, Nebraska held Wisconsin to just one field goal in the final 4:40 to come back from a 46-44 deficit and claim a 51-48 women’s basketball win over the visiting Badgers on Sunday afternoon at Pinnacle Bank Arena. With the victory in a front a season-high crowd of 6,823 pink-clad fans on Play4Kay day, Nebraska improved to 18-7 overall and 9-3 in the Big Ten to move into a tie with nationally ranked Ohio State in the league standings. The Huskers trail only No. 10 Maryland in the league race. Wisconsin slipped to 9-17 overall and 2-11 in the conference. 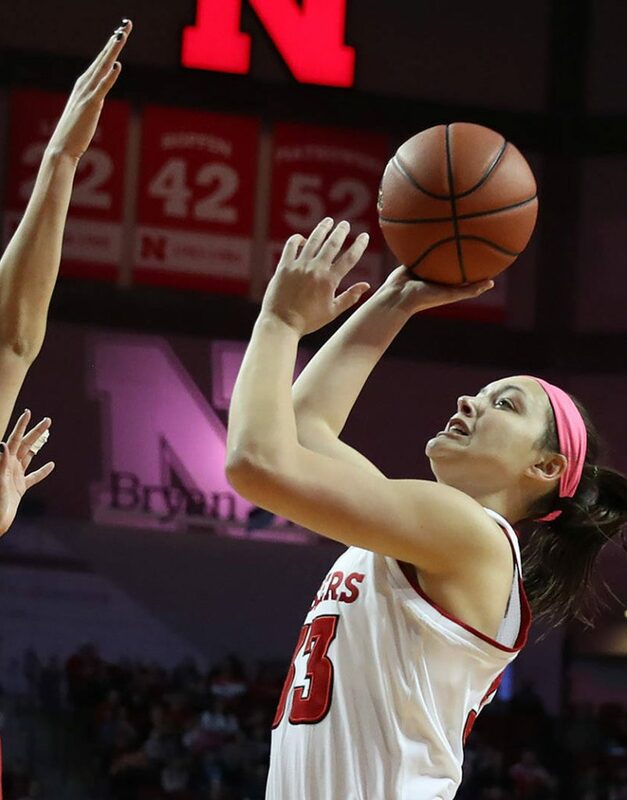 Freshmen Kate Cain and Taylor Kissinger combined for 25 points, 14 rebounds and three blocked shots to account for nearly half of Nebraska’s point production in a low-scoring game. Cain just missed a double-double with 14 points on 7-of-10 shooting while adding nine boards and two blocks. Kissinger fueled another huge effort by the Husker bench, pumping in 11 points while adding five rebounds and a block. NU’s bench outscored Wisconsin 24-8 on the afternoon. Junior Maddie Simon came up big for Nebraska in the fourth quarter, scoring six of her eight points in the final period. Her back-to-back buckets gave the Big Red a 42-41 lead with 8:19 left in the game, before her two free throws with three seconds left sealed the victory. Simon also helped make one of the game’s biggest defensive plays for Nebraska, as her jumping jack defense on a sideline inbounds pass with 6.7 seconds left forced a five-second call on the Badgers. Simon finished with eight points, five boards and two blocks. Trailing 46-44 after Badger Cayla McMorris’ third three-pointer in a 5:20 span, Husker sophomore Nicea Eliely came up with a three-point play on a driving layup with 3:51 left. Eliely’s only points of the day gave Nebraska the lead for good, before a driving layup by Kissinger pushed the margin to 49-46 with 2:54 left. In addition to Kissinger’s 11 points off the bench, senior guard Janay Morton pumped in nine points on a trio of three-pointers in the first half to help the Huskers stay close with the Badgers in the opening 20 minutes. The Badgers built a 10-point lead on two occasions early in the second quarter, before Morton hit back-to-back threes to pull NU with six at 22-16. Nebraska trailed 28-24 at the half after shooting just 34.5 percent (10-29) from the field. In addition to Morton’s nine first-half points, Cain added eight points, six rebounds and two blocks for the Huskers. However, Cain was the only Husker starter to hit a field goal in the first half. Wisconsin built as big as a 10-point lead in the second quarter, thanks to 12 points from Marsha Howard on 6-of-7 shooting. Suzanne Gilreath added six points on a pair of threes in the second quarter, as Wisconsin hit 40.6 percent (13-32) of its field goal attempts in the first half. Nebraska won the first-half rebound battle, 21-16, but Wisconsin committed just one turnover while forcing six by the Huskers. The Badgers turned Nebraska’s six turnovers into five points to provide the difference in the first half. Even though Nebraska got six offensive rebounds compared to just four for Wisconsin, the Badgers outscored NU 7-4 in second-chance points. Wisconsin rebuilt the lead to 35-28 midway through the third quarter, before Bria Stallworth and Kissinger ignited an 8-0 run to give Nebraska its first lead since 3-2. Kissinger started the run with a pair of free throws before Simon added a free throw of her own with 2:50 left in the quarter. Stallworth then hit Kissinger on time with a sharp pass to the right wing for a three-pointer to trim the edge to 35-34 with 2:07 left. Stallworth capped the run with a long two-point jumper from the left wing to put the Huskers up 36-35 with 1:28 left in the period. However, McMorris buried a three from the right corner to send the Badgers to the fourth quarter with a 38-36 lead. Her three snapped a 6:35 field goal drought for UW. She and Howard combined for all 10 of Wisconsin’s points in the fourth quarter but it wasn’t enough to send the Badgers back to Madison with a victory. Howard finished with a game-high 23 points while adding nine rebounds. She hit 11-of-17 shots from the field for the game, including 9-of-10 through the first half and early part of the third quarter. McMorris was the only other Badger in double figures with 11 points on 4-of-15 shooting, including 3-of-5 threes. Nebraska held Wisconsin to 37.5 percent (21-56) shooting for the game, but the Badgers did hit 5-of-12 threes. They were just 1-for-3 at the free throw line, with all three attempts coming from Howard. The Huskers outrebounded Wisconsin 37-30, but lost the turnover battle, 13-10. Nebraska hit 40 percent (20-50) of its shots for the game, including just 4-for-17 threes, while hitting 7-of-9 free throws. The Huskers return to Big Ten road action for a pair of games this week, beginning with a Valentine’s Day clash at Michigan State. Tip-off between the Big Red and the Spartans at the Breslin Center in East Lansing on Wednesday is set for 6 p.m. (CT). Michigan State knocked off rival Michigan in East Lansing on Sunday afternoon. Taylor Kissinger scored 11 points.